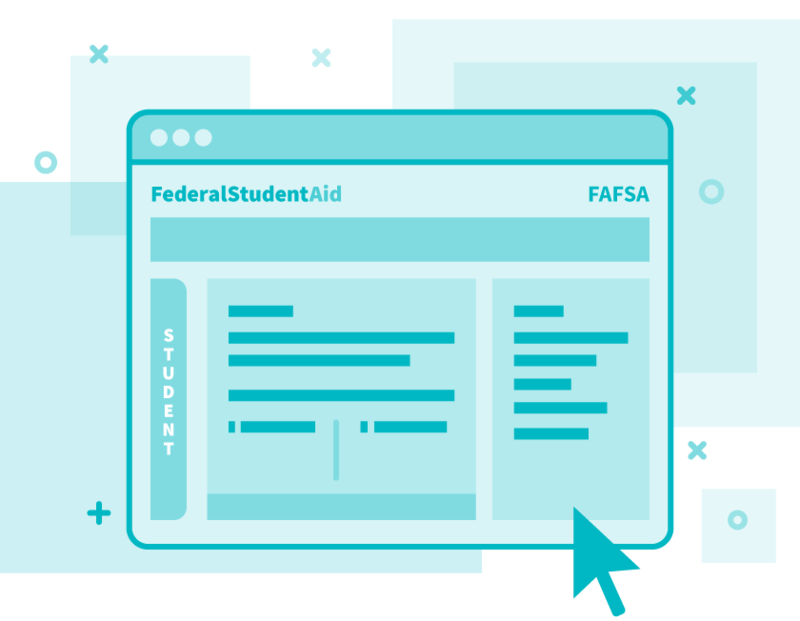 To help you fill out the Free Application for Federal Student Aid (FAFSA), prepare all of the required documents and follow our question-by-question guide. 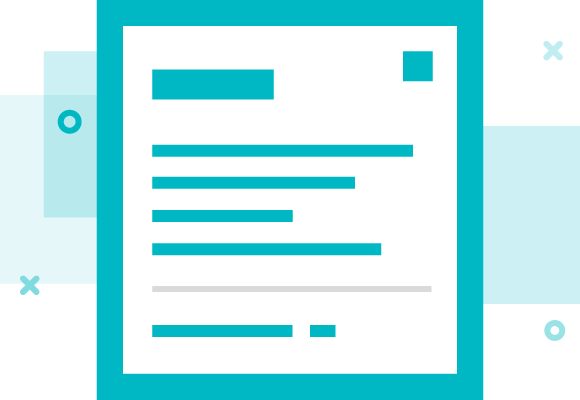 If you need more help from our financial aid expert, sign up here for a free printable FAFSA guide. 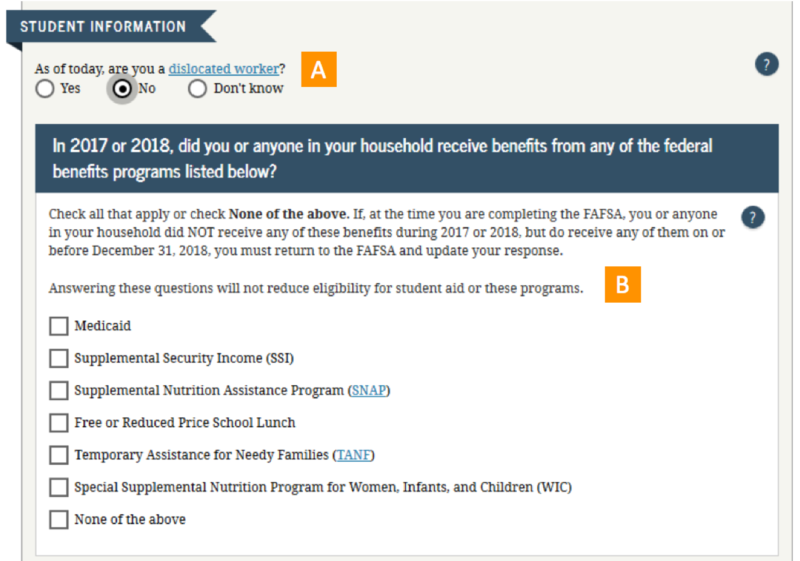 Your FSA ID, which you can create on fsaid.ed.gov. 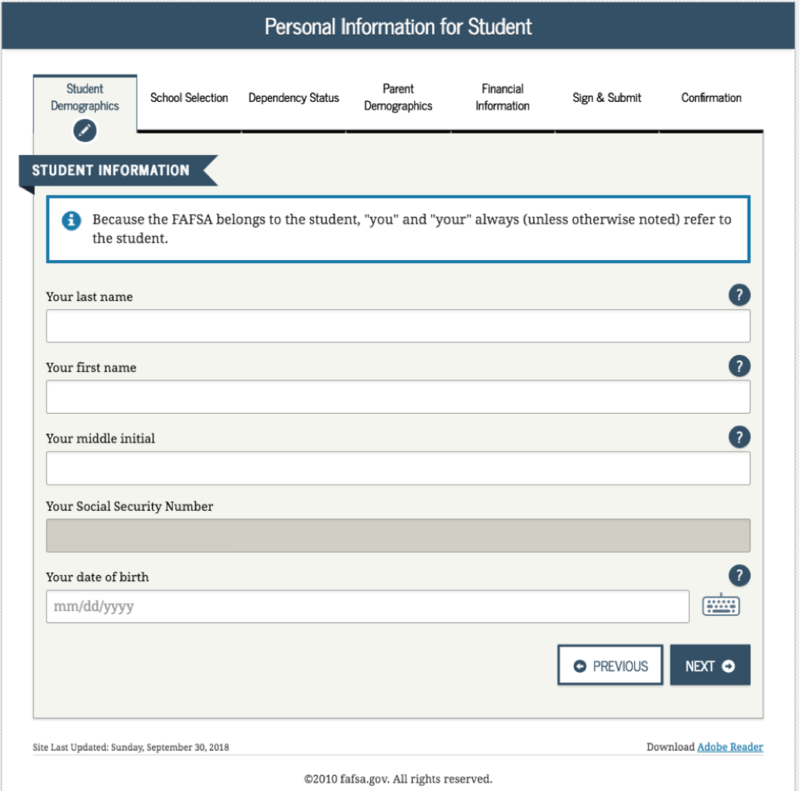 Note that students and parents will need to create their own FSA ID and keep it private. Your social security number and driver’s license, and/or alien registration number if you are not a U.S. citizen. 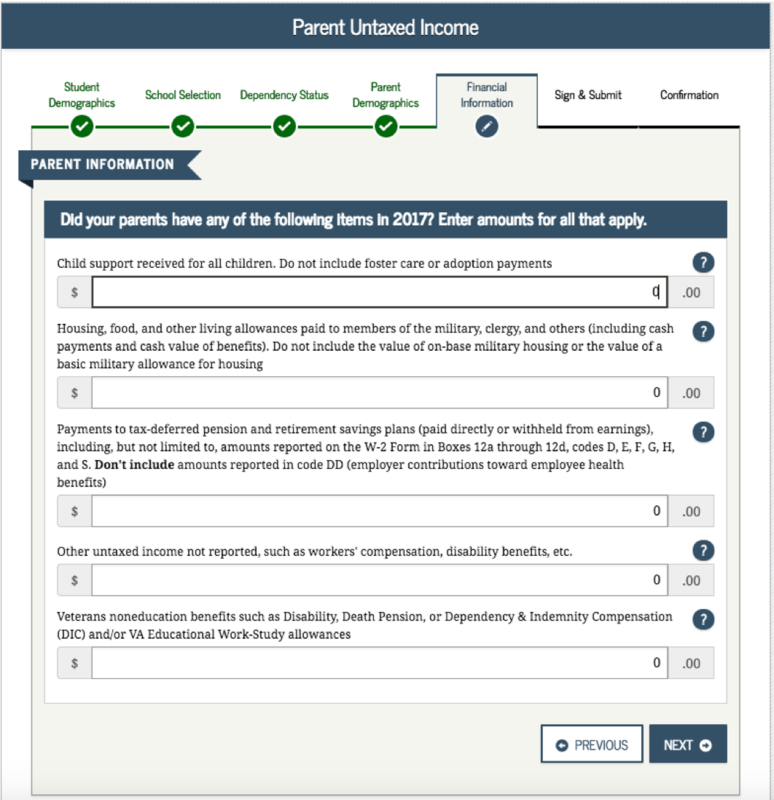 Your parents income tax returns, W-2 forms and 1040 forms if you’re a dependent. 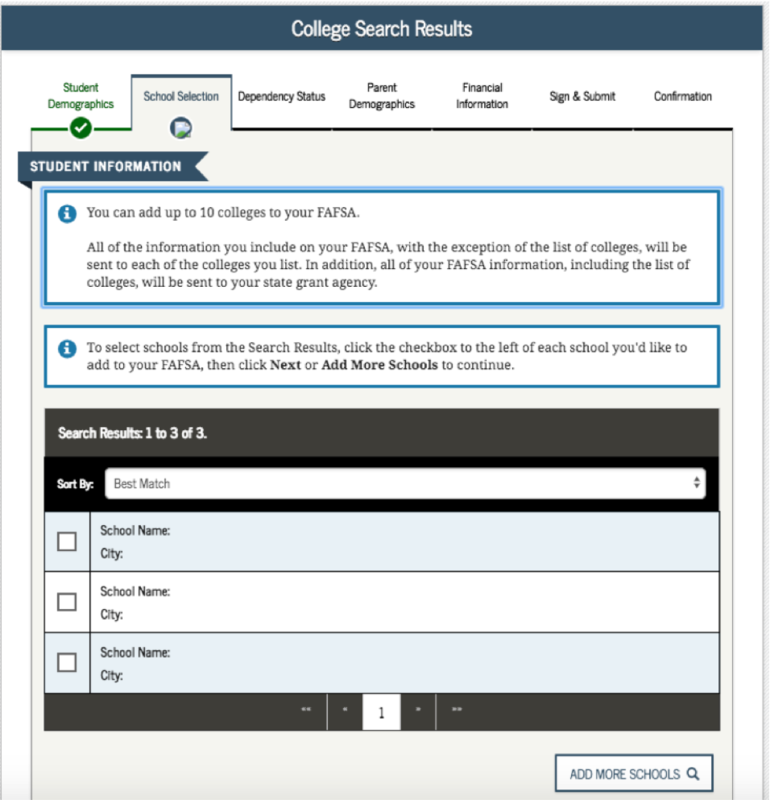 Title IV Institution Codes for each school you’re applying to, which you can find from the FAFSA federal school code search. Choose the option that best applies to you. Input the email or username that you used to create a FSA ID and then the password. 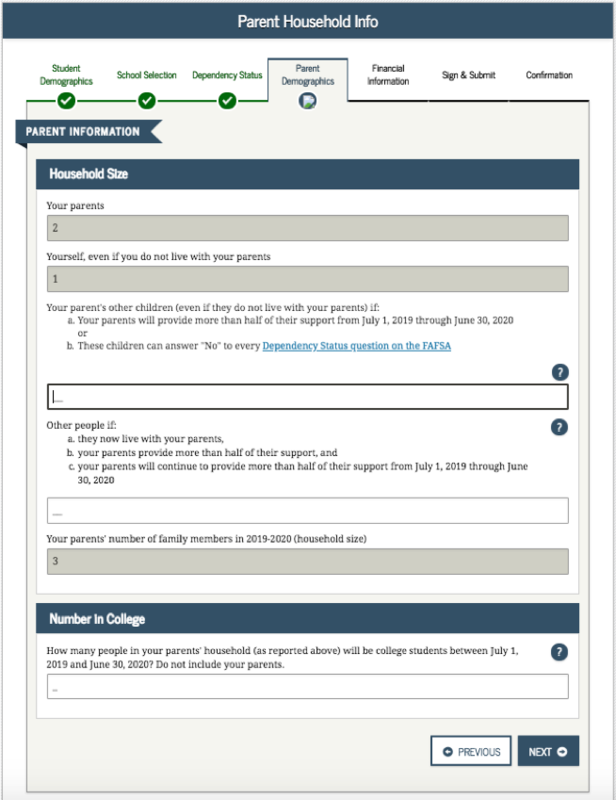 If you haven’t created a FSA ID yet, you can create one here. Select "accept" if you agree with the disclaimer. A. 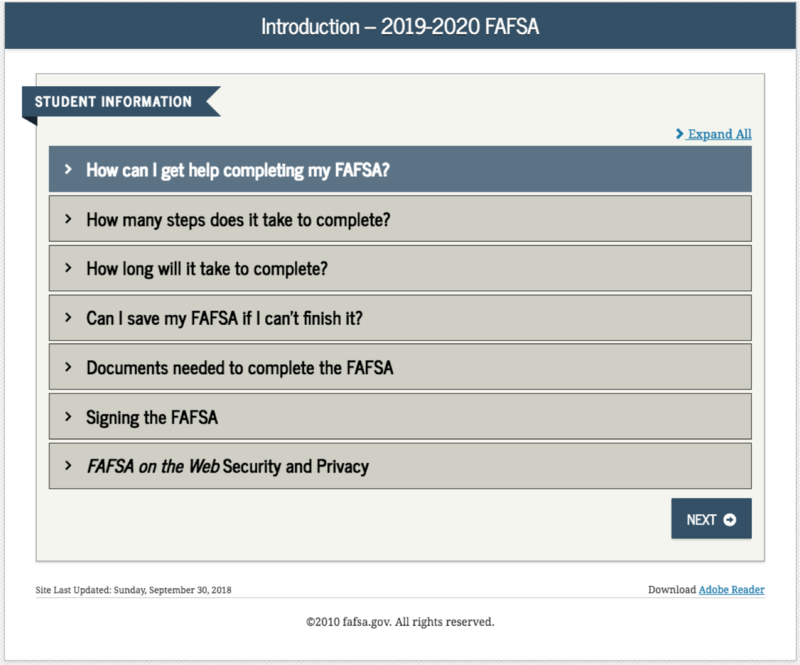 If you submitted a 2018-2019 FAFSA, select ”FAFSA Renewal" for the information from that application to be used to renew your 2019-2020 FAFSA. B. 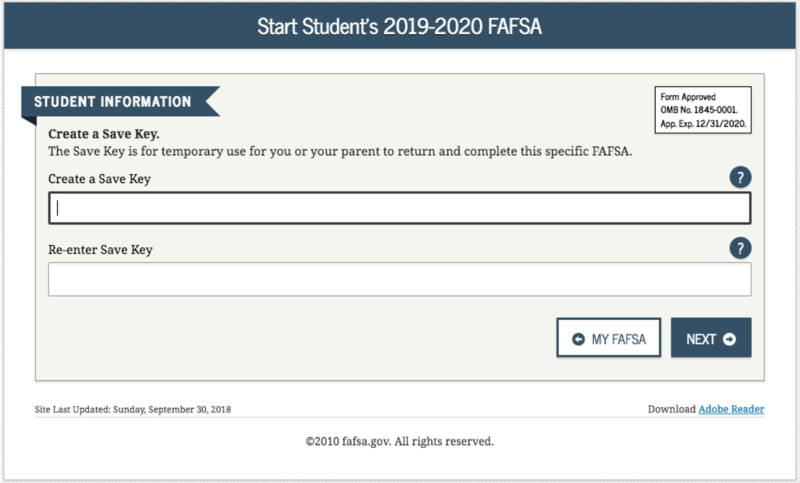 If you didn't submit a 2018-2019 FAFSA, select "Start New FAFSA." Create a save key that's between 4 and 8 characters long. It can contain any combination of numbers and/or uppercase and lowercase letters. Re-enter the save key. Remember to Save! 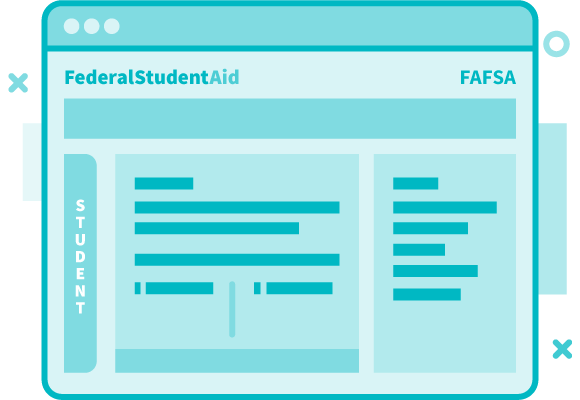 You can use the "next" and "back" buttons to move through the FAFSA, but make sure to save your entries to avoid losing any data throughout the process. Note: the web app is a smart form and so additional or different questions may come up based on the user’s responses. We will note where we know this to be the case. Note: much of this section will be pre-filled from the FSA login. Input your last name exactly how it appears on your Social Security card. If your name has a suffix, such as Jr. or III, include a space between your last name and suffix. Input your first name exactly how it appears on your Social Security card. Input your middle initial exactly how it appears on your Social Security card. Input your Social Security Number (SSN). Confirm that you enter your SSN accurately before moving on in the process. Input your date of birth (month / day / year). Input the number and street, including the apt. number, of your permanent mailing address. 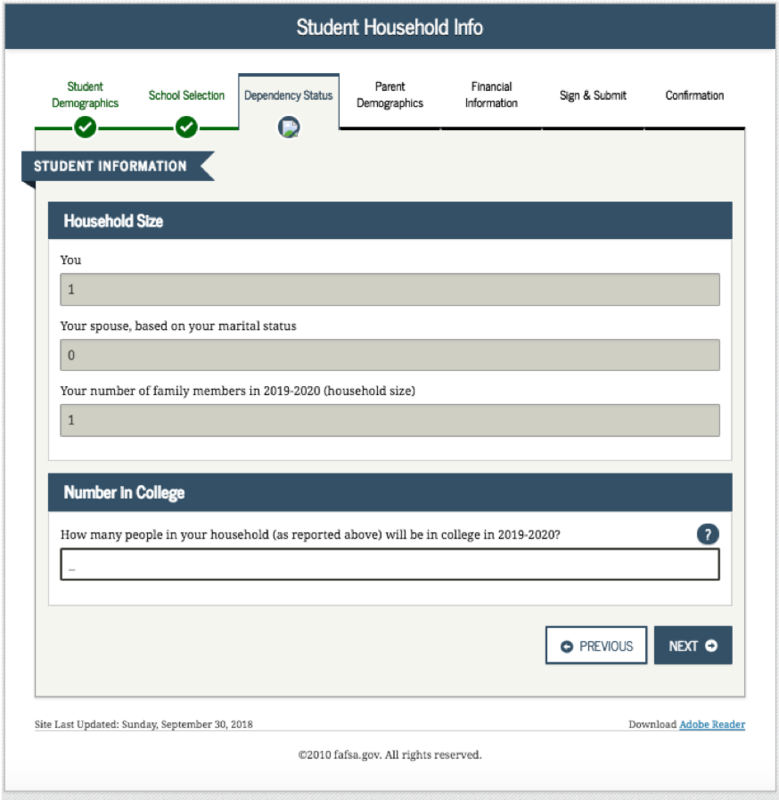 Although you may use your college’s mailing address after you are an enrolled student, you'll need to use your home address when filing the FAFSA. Input your city of residence. Include the country if it's not located in the U.S. 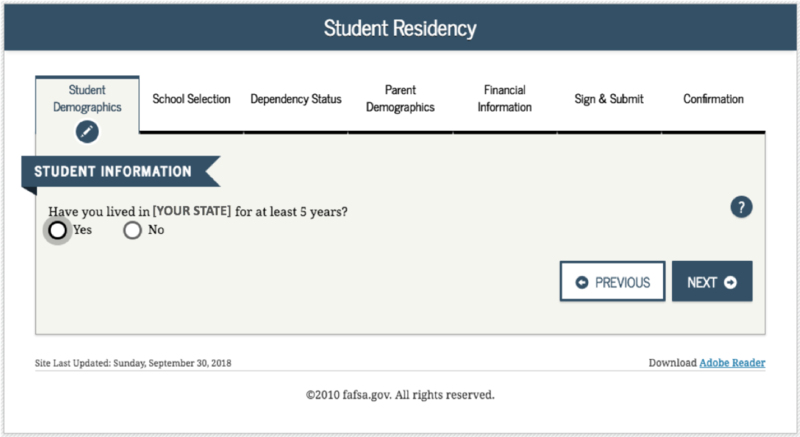 Input your state of residency. Leave blank if located outside of the U.S. If you provide your email address, you will be contacted electronically. For example, when your FAFSA has been processed, you will be notified by email. Your email address will also be shared with your state and the colleges listed on your FAFSA to allow them to contact you. Leave this field blank if you don't have an email address. Select "yes" if this is your state of legal residence and you have living there for 5 years or more. This state will represent your state of legal residence, which is where you reside and have a true, fixed, and permanent home. If you moved into this state for the sole purpose of attending a school, do not count this state as your state of legal residence. Note. 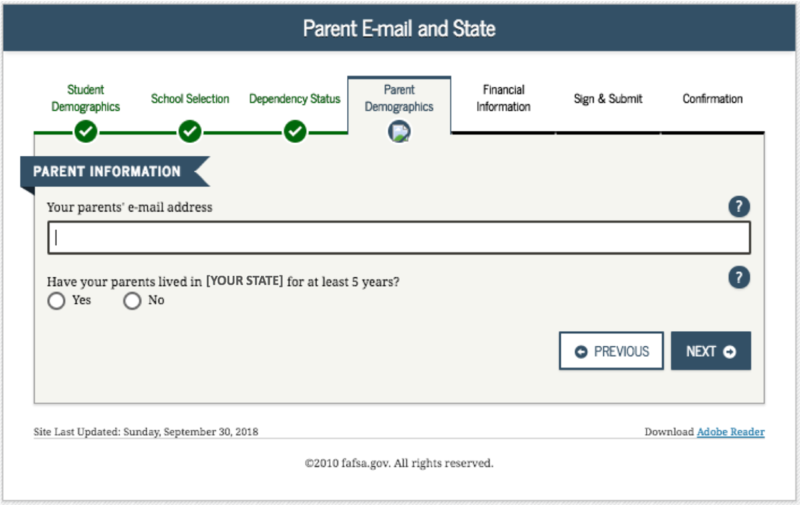 You might receive a note that you can transfer your FAFSA information to your state’s student aid application once you receive the confirmation page after submitting your FAFSA. A. Answer this question 'Male' or 'Female' with reference to your gender assignment at birth. You are asked to answer about your gender in this question as a way to determine whether or not you are legally required to register for Selective Service. B. Enter the best phone number to reach you. 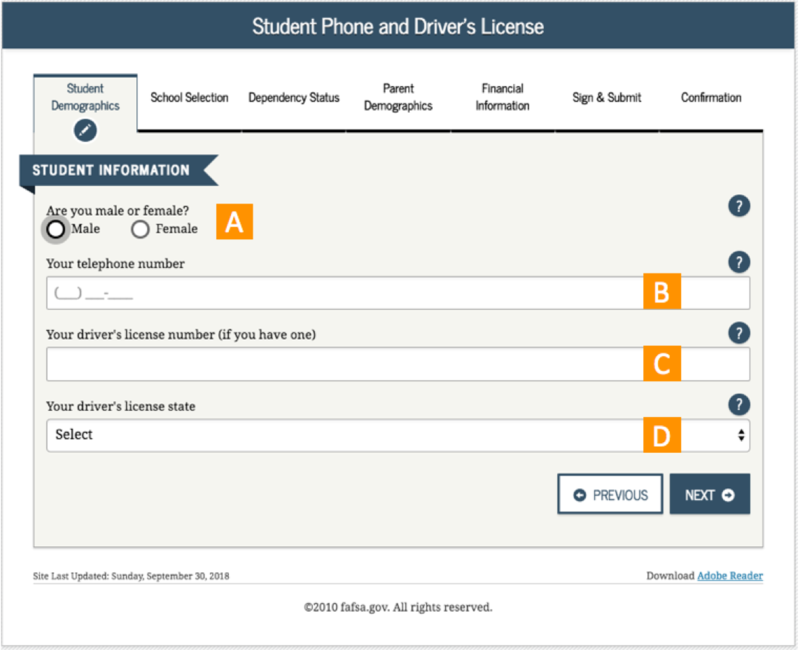 C. If you have a driver's license, input your driver's license number without spaces or dashes. Providing this information allows for further confirmation of your identity to the Department of Education. If you have a state-issued ID card, you do not want to enter this information instead, as it may cause a mismatch when the application is processed. D. Enter the state in which your driver’s license is issued. Select your marital status as of today from the dropdown. You are asked about your marital status in order to determine if you will be required to provide any spouse’s information along with your own throughout the application. Select if you're a U.S. citizen from the dropdown. 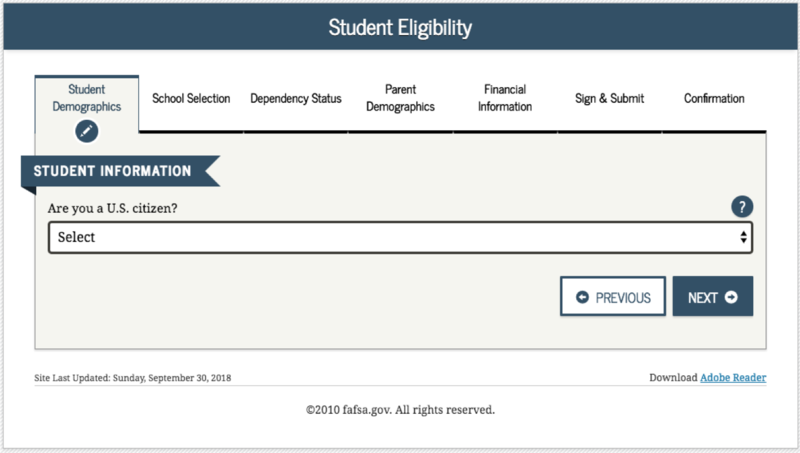 The Department of Education requires that you meet certain citizenship criteria in order to receive Federal financial aid. You are automatically eligible if you are a U.S. citizen or U.S. national (natives of American Samoa or Swain’s Island). 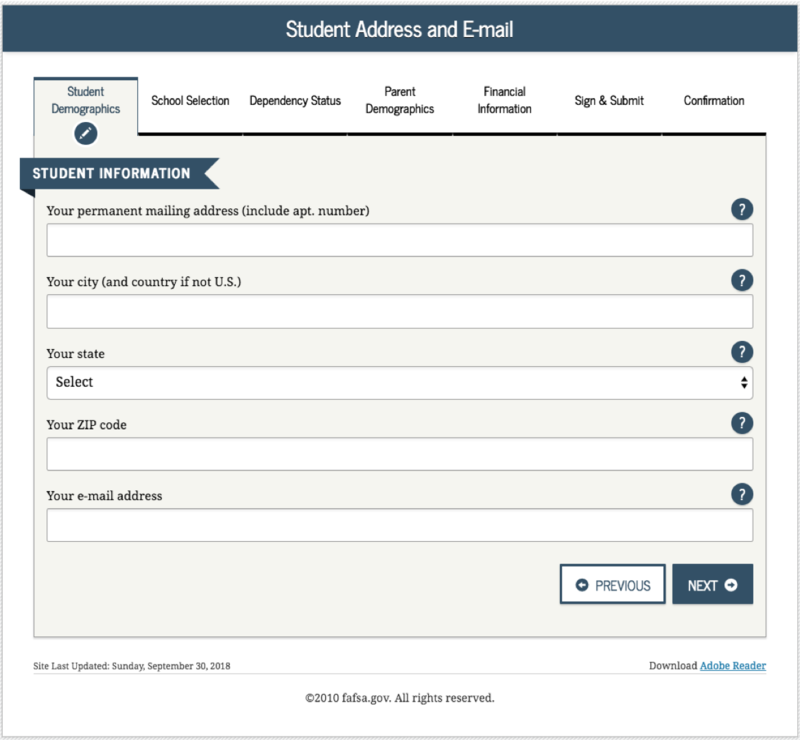 If you are neither a citizen nor an eligible noncitizen, you are not eligible for federal student aid, but you may still qualify for local state grants. For this reason, you will still want to continue and complete the FAFSA. A. 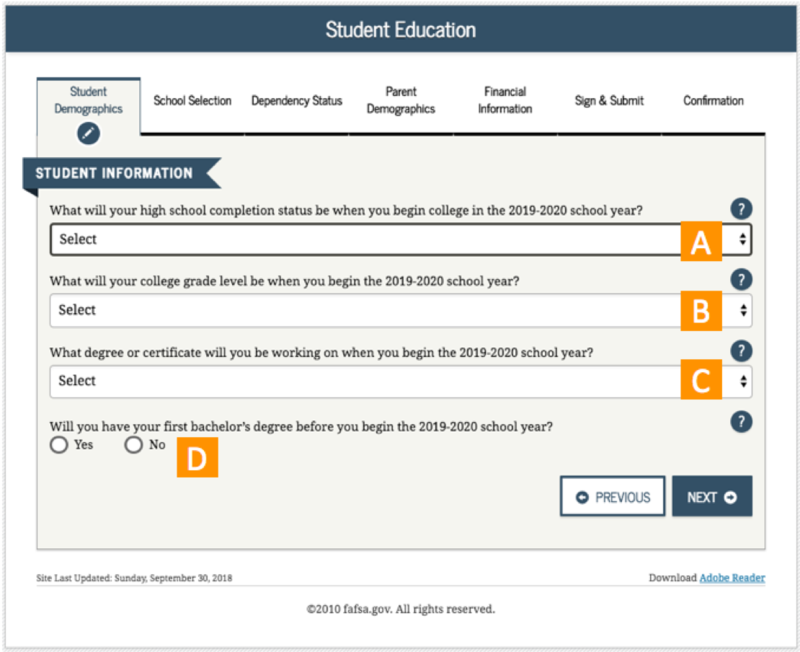 This question aims to determine your level of high school completion prior to enrolling in an institute of higher learning. 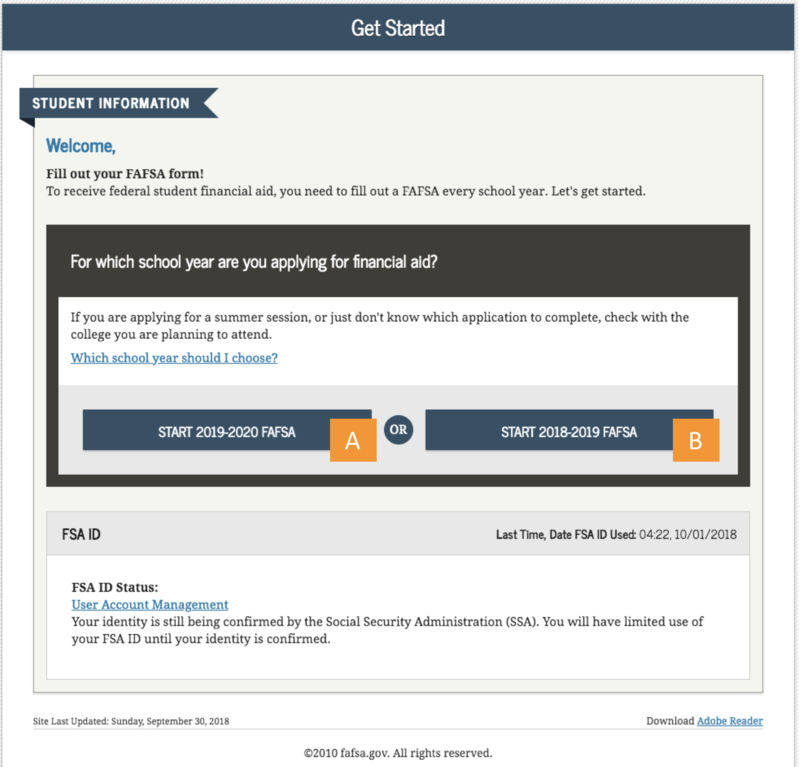 This will help to determine your eligibility for federal financial aid. Click here for more help. B. This question aims to determine your level of undergraduate, graduate, or professional schooling prior to enrolling in an institute of higher learning. 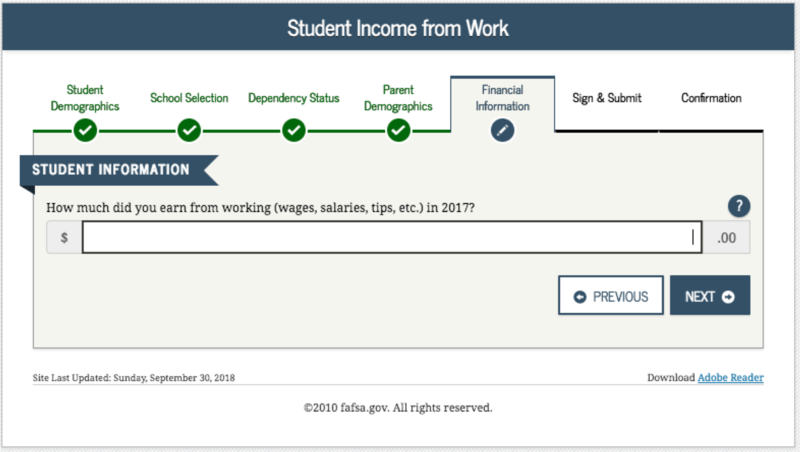 This will help to determine your dependency status, which will also determine your eligibility for federal financial aid. Need more help? C. The Department of Education wants to know what area of study you intend to undertake academically while receiving federal funding. Click here to learn more. Enter the complete name of your high school. Enter the city that your high school is located. 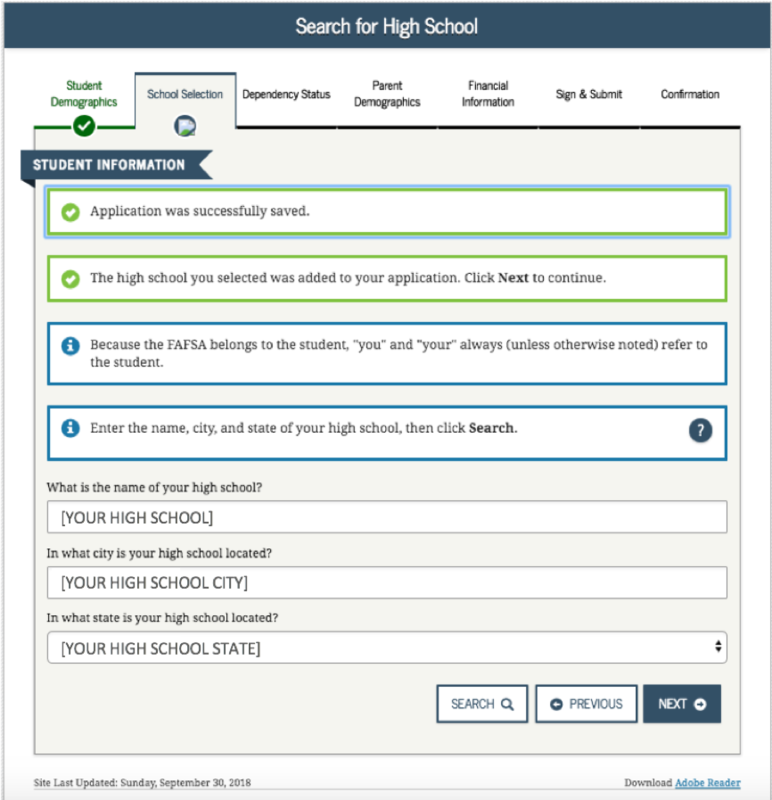 Select the state that your high school is located in from the dropdown. Note. If you receive an error message from this page, make sure you are clicking “search” rather than “next” in order to identify your high school. Your search results should look like this. Choose your high school from the list by clicking “select” on the left. Once you select your school from the previous page, it will appear on this page. 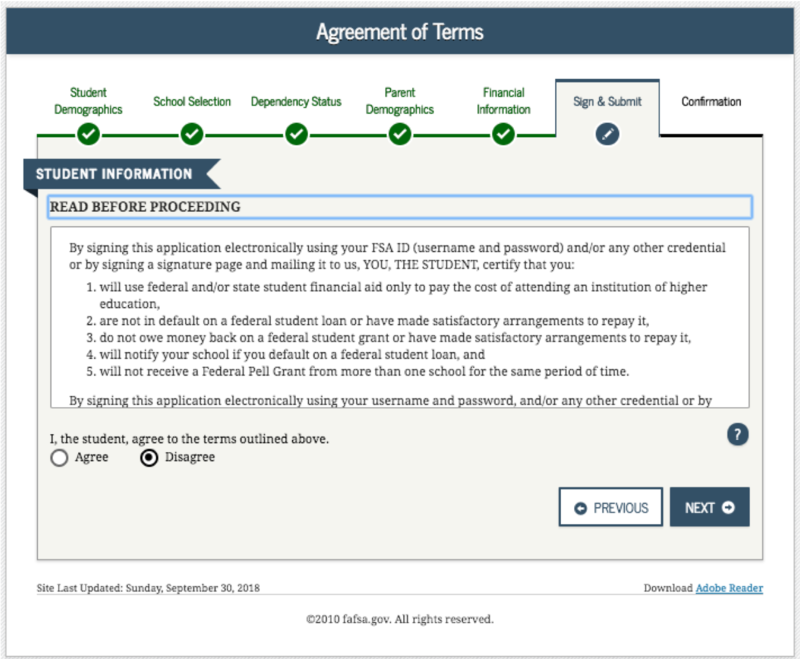 If you know the college’s Federal School Code, you can choose “Yes” and enter the code on this page. You may select up to ten schools that you're interested in attending. To do so, enter the city, state, and name of the college. Enter the Federal School Code for up to ten schools. 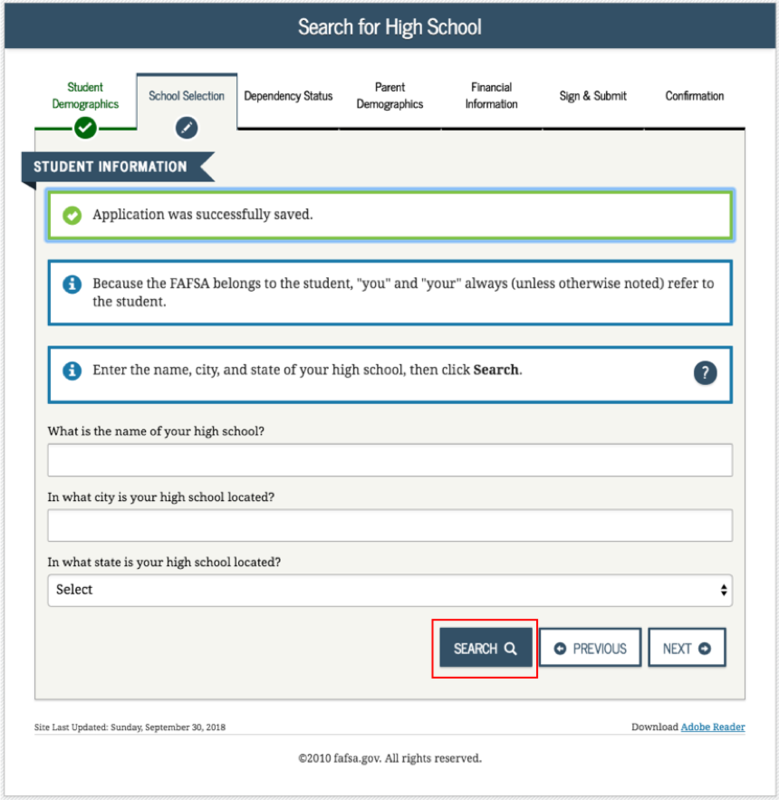 If you do not know your intended college’s Federal School Code, and would prefer to use it rather than the search feature, you will most likely be able to find it on the intended college’s financial aid website. 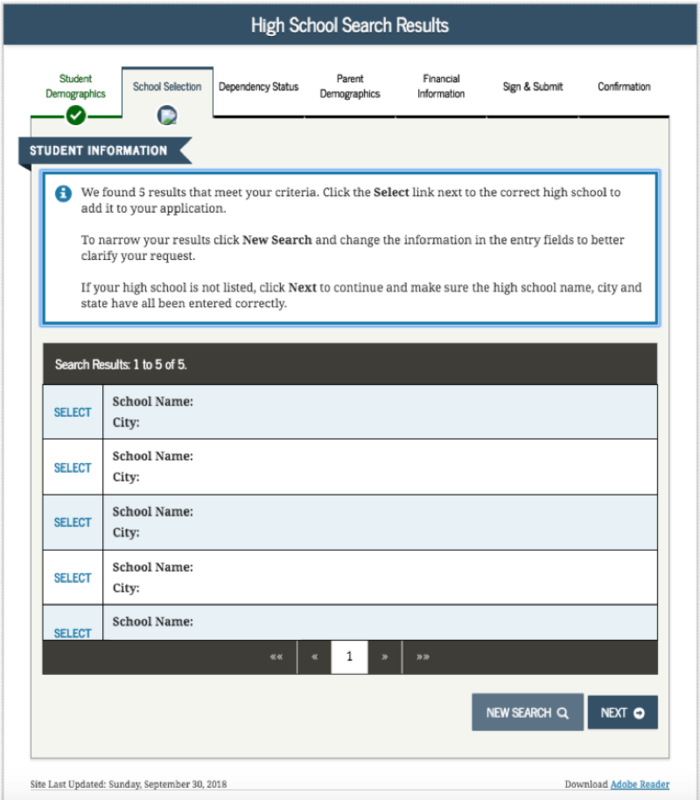 Select the correct school from the search results by clicking the checkbox on the left. 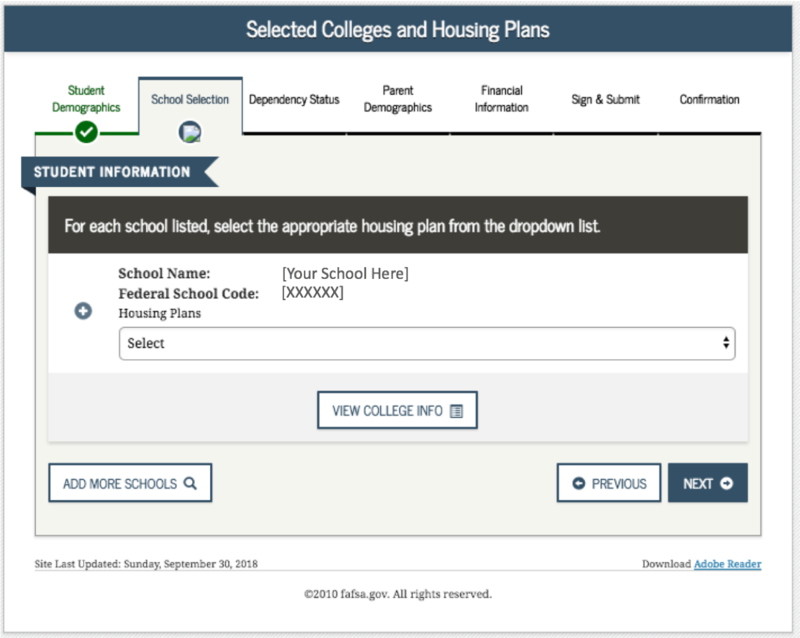 Enter your housing plan for each school selection. If you plan to live in a dorm, your housing costs will be calculated using the amount that the school charges. If you live off-campus, you'll be awarded a housing allowance. Select "Yes" if you have children, or are expecting children in the year for which you are applying for aid. Select "No" if not. 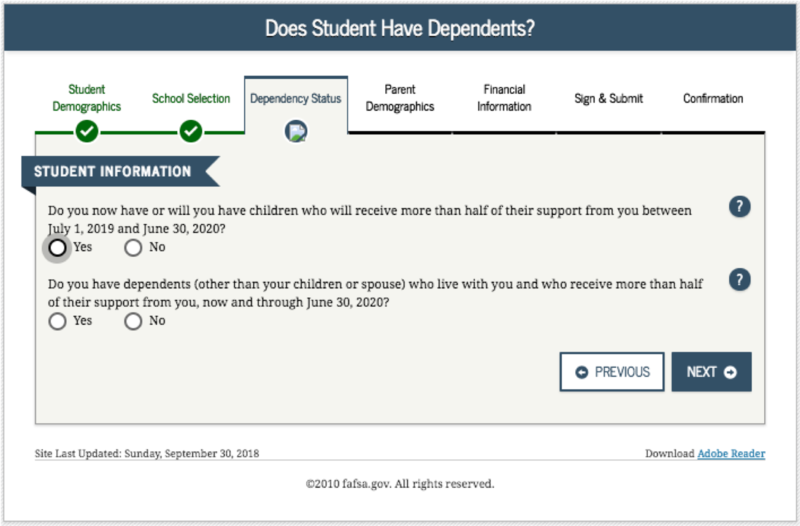 Select "Yes" if you have a dependent (someone who may not be your own child, or possibly even a parent), AND you also provide more than 50% of their living expenses. Select "No" if not. You will want to count the number of people living in your household/home, beginning with yourself, then your parent(s), and any other siblings or relatives for whom your parent(s) pay 50% or more of their financial support. Count yourself, but also include any siblings who will attend and be enrolled as part-time students, as well. You do not want to include your parents in this section, even if they are in college or a degree-seeking program. Adults who have already earned a degree, are in graduate or professional programs, or who are over the age of 24 will not be counted as simultaneously being in college during the same period as you. Select the marital status of your parents from the dropdown. As a point of clarification, if one of your biological parents is divorced from the other, you will only need to report the financial information of the parent who has legal custody of you. Note. This is a smart question and the response to marital status may generate additional questions. A. 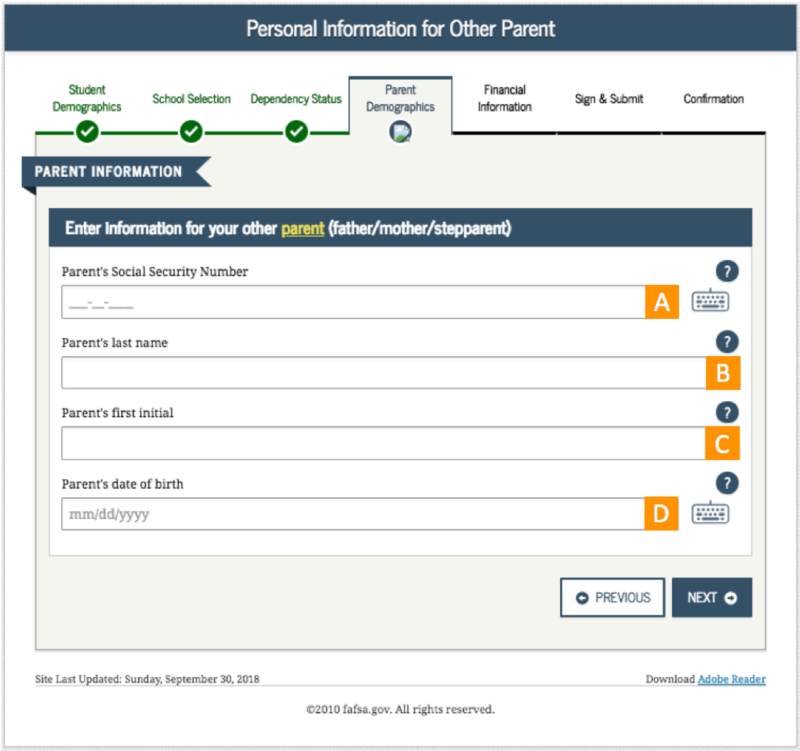 You may choose whichever of your parents for either field, but do not mix “first parent” figures with “other parent” as this may cause an error in your application. If your parent does not have a Social Security Number, you must enter 000-00-0000. B. Includes your parents last name as it appears on their Social Security card(s) and birth certificate(s). If the name includes a suffix, such as Jr. or III, include a space between the last name and suffix. C. Include your parents first initial as it appears in their first name on their Social Security card(s) and birth certificate(s). D. Includes your parent’s date of birth as it appears on their Social Security card(s) and birth certificate(s). Enter two digits for each day and month (e.g., for May 31, enter 05 31). Input your parent's email address. Select "yes" if this is the state of your parents legal residence for 5 years or more. This state will represent their state of legal residence, which is where they reside and have a true, fixed, and permanent home. If your legal parents (biological and / or adoptive) have different states of legal residence, answer for the parent that you lived with most during the last 12 months. If you did not live with one parent more than the other, provide information about the parent who provided more financial support during the last 12 months, or during the most recent year that you actually received support from a parent. For “Number in College,” count yourself, but also include any siblings who will attend and be enrolled as part-time students, as well. You do not want to include your parents in this section, even if they are in college or a degree-seeking program. Adults who have already earned a degree, are in graduate or professional programs, or who are over the age of 24 will not be counted as simultaneously being in college during the same period as you. A. 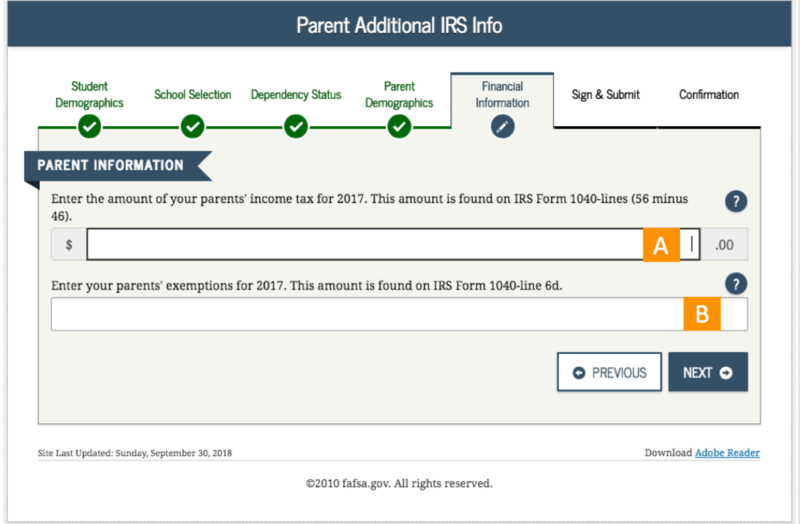 This specific question asks your parent/parent's what their tax filing status is for the tax year 2017. 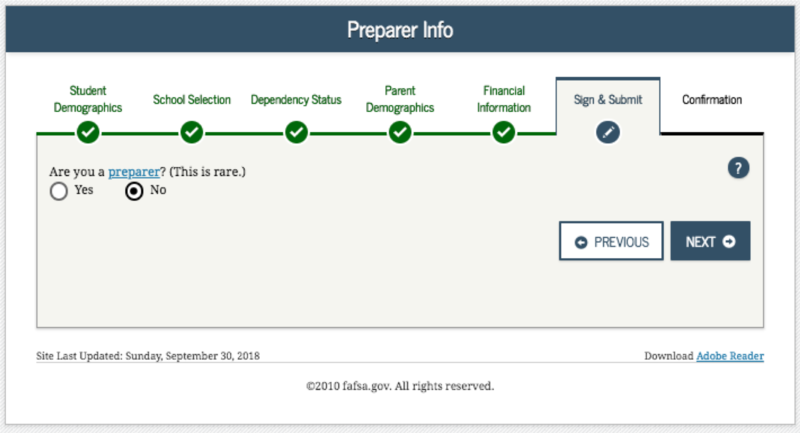 You may select from the drop menu whether your parent/parents: “Already Completed”, “Will File”, or “Not Going to File.” There is no wrong answer, but it is important to be as accurate as possible. B. 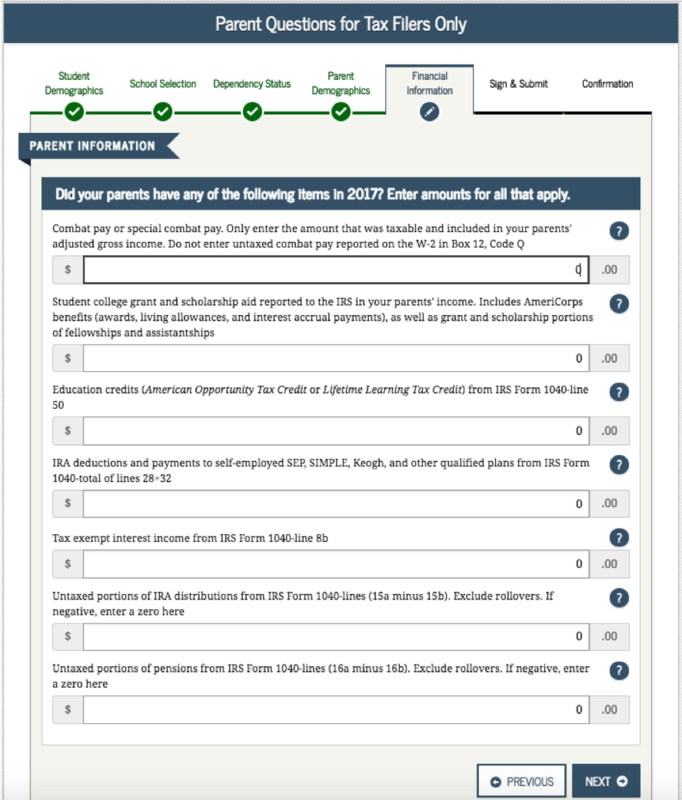 Select what your parent/parent's tax filing status is according to their 2017 tax return. 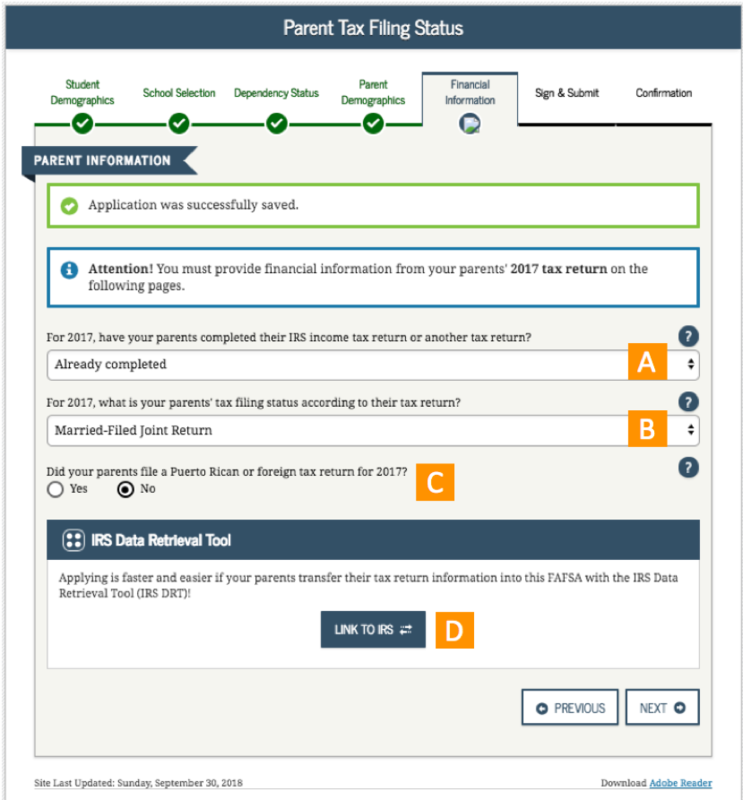 C. You will select “Yes” if it is determined that your parents could have filed a Puerto Rican or foreign tax return for 2016. You will select "No" if they didn't. 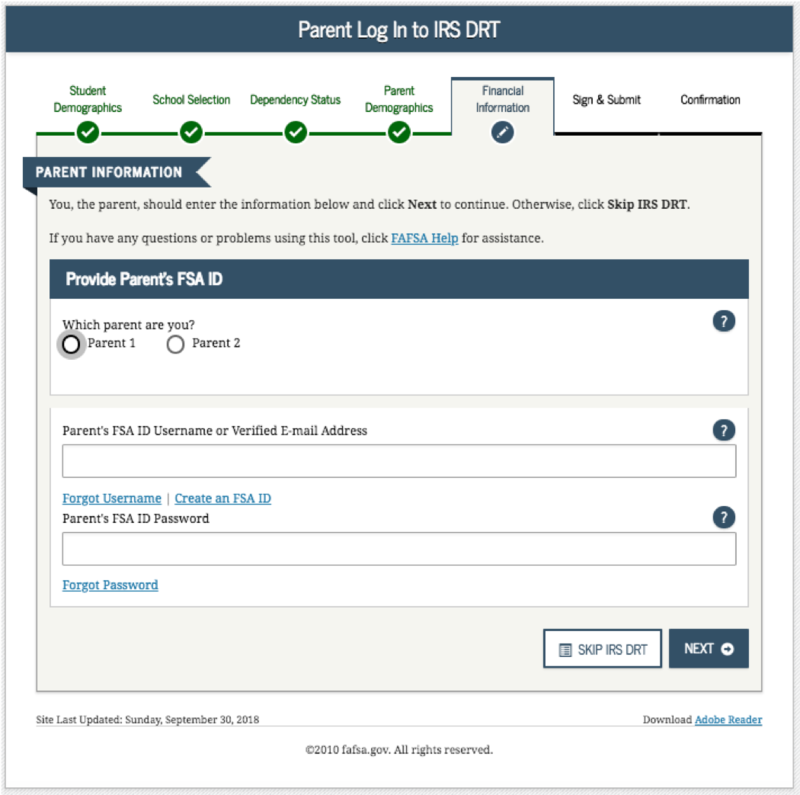 D. By using the IRS Data Retrieval Tool, parents who are eligible can automatically transfer their tax information into the FAFSA. This will prevent errors and help avoid any processing delays. 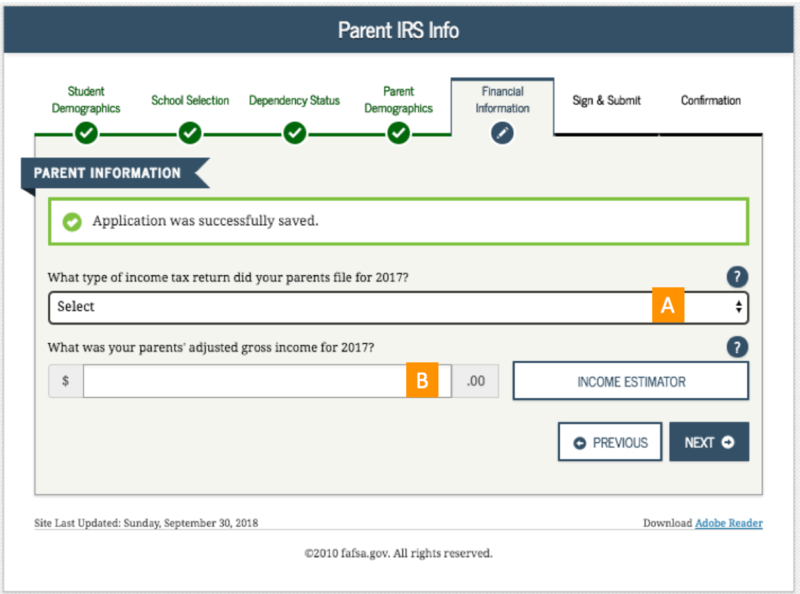 If you are able to connect tax data through the IRS data retrieval tool (DRT), this is what you should see. 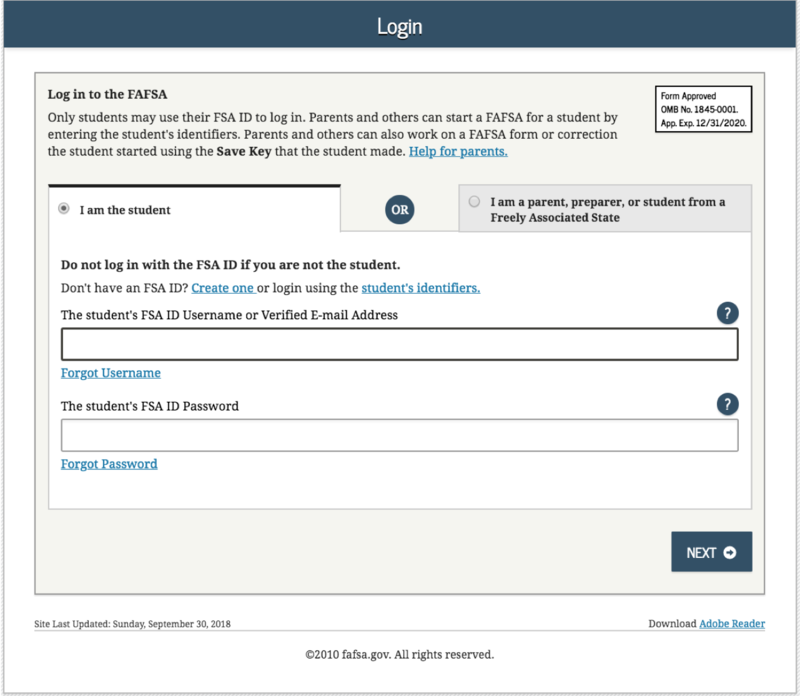 Input the parent’s FAFSA ID Username and Password Here. If they do not have one, they can create one here. 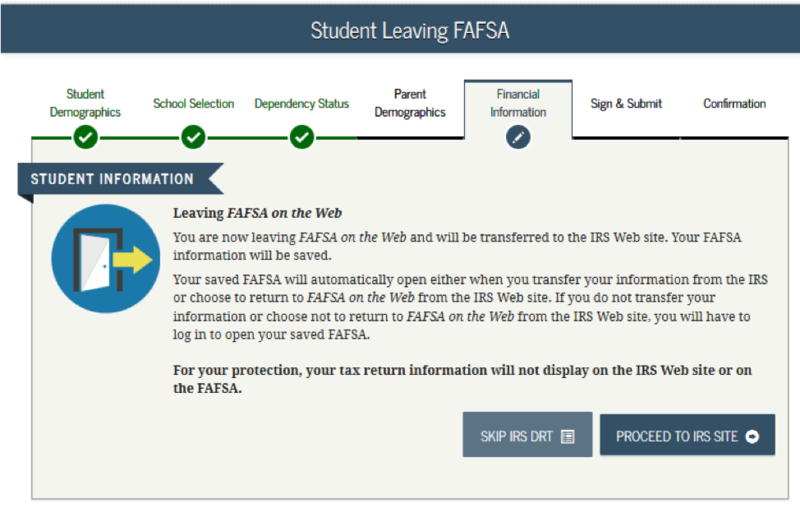 This page will appear to notify you that you are leaving the FAFSA website. Click ”proceed to IRS site” to continue with the IRS data retrieval tool. 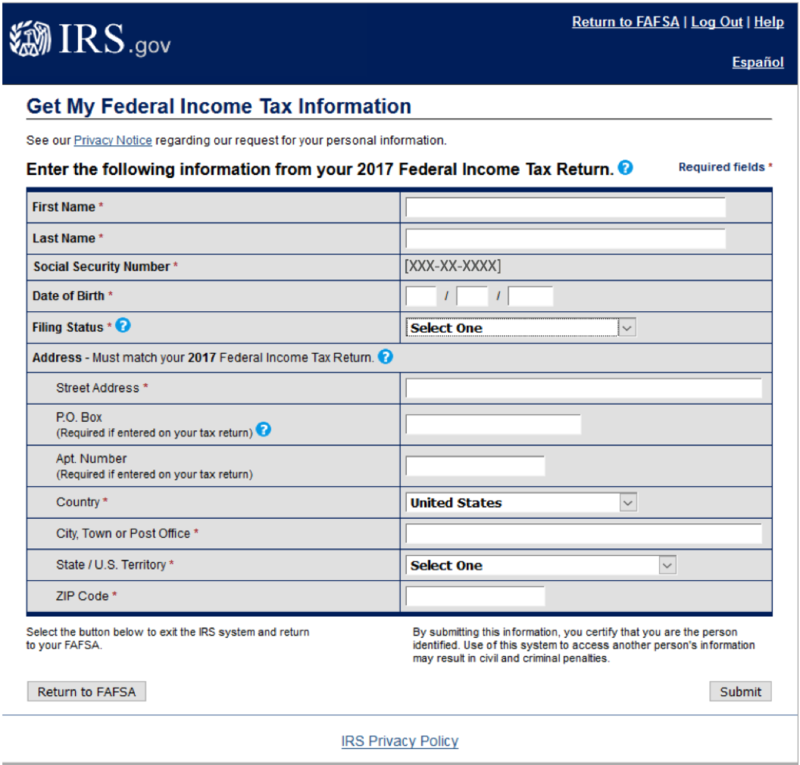 Input your information is it appeared from your 2017 Federal Income Tax Return. A. 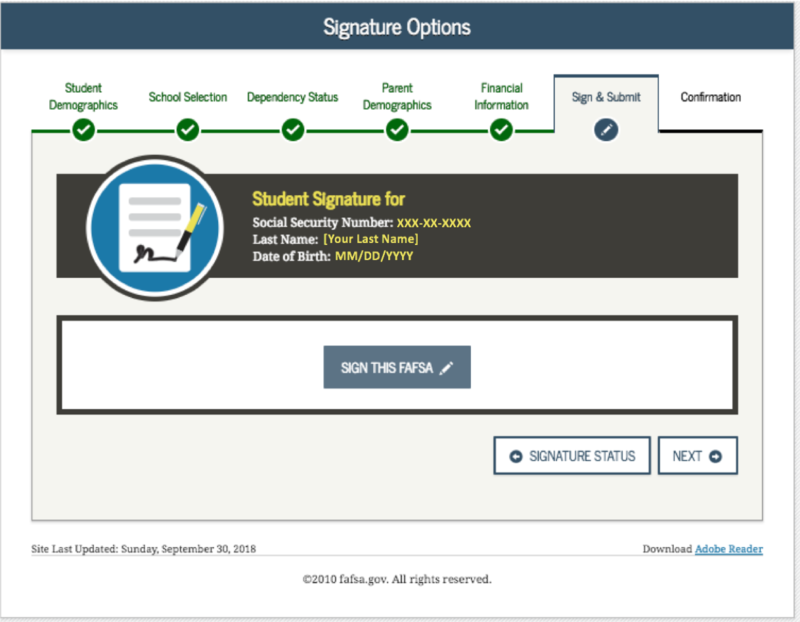 Select "Transfer My Tax Information" if you agree to transferring your tax information into the FAFSA via the IRS Data Retrieval Tool. B. 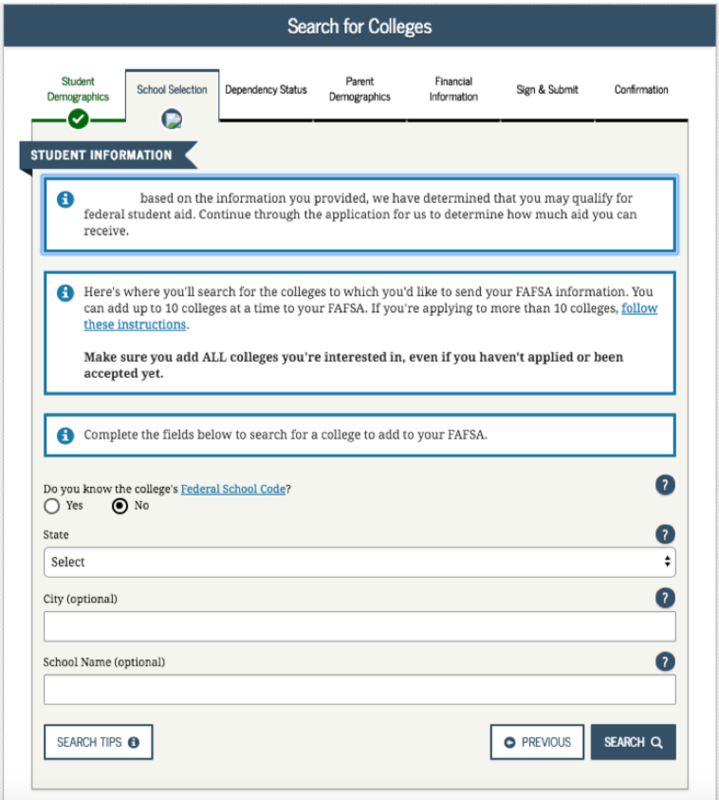 Select "Do Not Transfer" if you don't want to transfer your tax information into the FAFSA via the IRS Data Retrieval Tool. This is an option of what will show if the DRT is successful. Note that “transferred from the IRS” will show up wherever a question is asked but the information has already come in from the IRS. 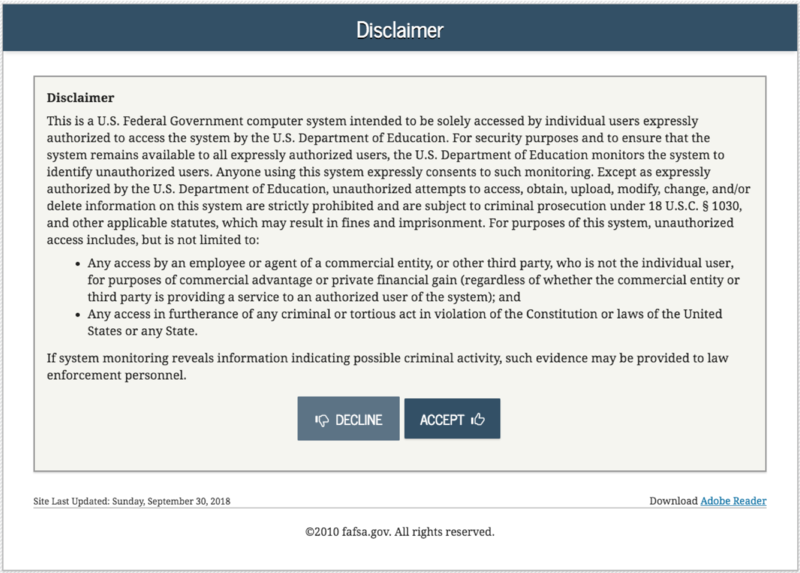 If you did not use the IRS DRT, you will see this screen. 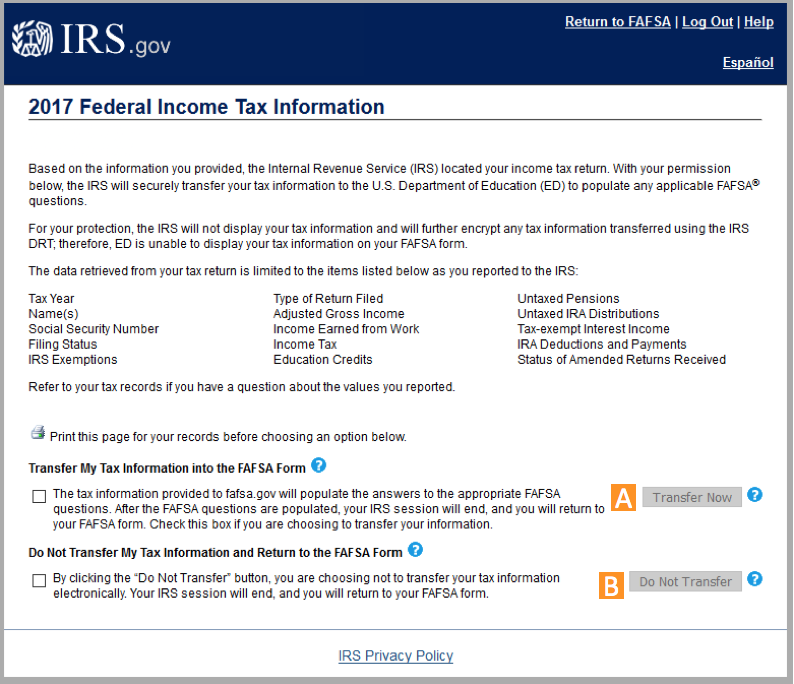 If you used the IRS DRT, this screen will not show for you. A. 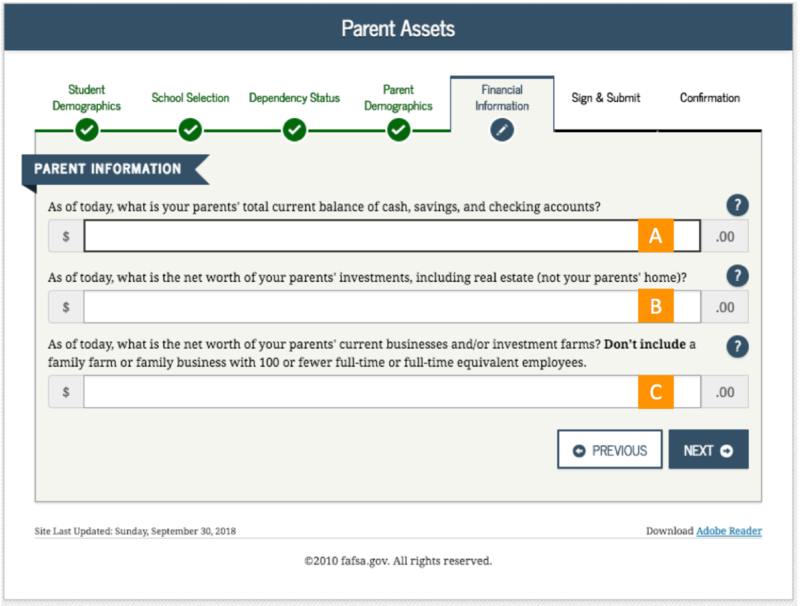 Select your parent's tax filing status according to their tax return in 2016. You will not have reached this question if you had answered “Not going to file” previously. B. This figure can be found on either Line 37 (1040), Line 21 (1040A), or Line 4 (1040EZ) of their Federal tax return. Parents who are married, but file separate returns will need to combine their AGIs from their individual return for this field. 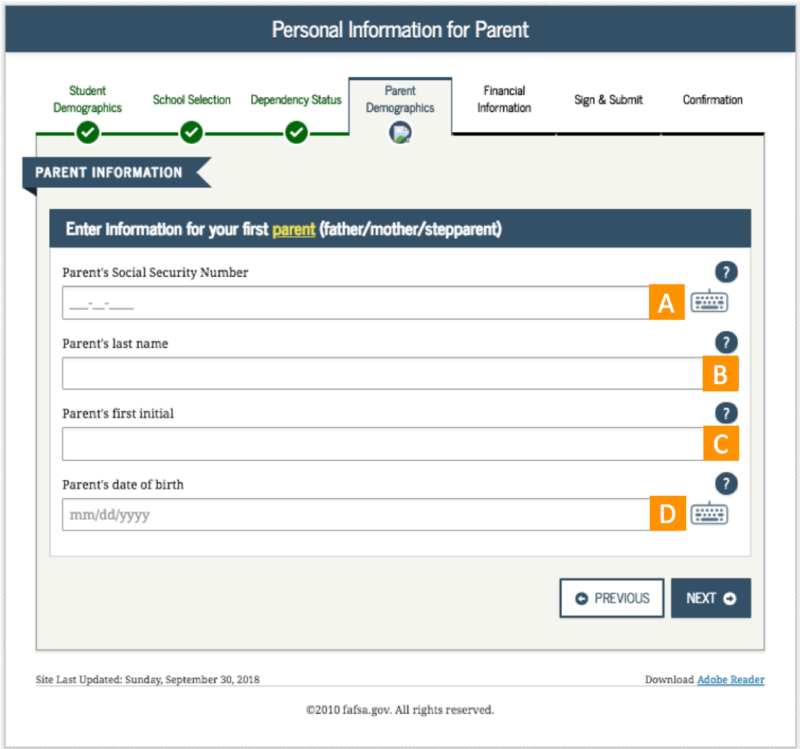 If your parent/parents are eligible and choose to use the IRS Data Retrieval tool, the fields in this section will automatically be populated for them. Note. This is a smart question and therefore might look different based on your prior inputs. Note. This is a smart question so these questions may or may not appear for certain users. A. If your parent/parent's select "Yes" to this question, they may be asked to provide proof of their status as a dislocated worker. This can be in the form of their termination notice, a recent receipt of their unemployment benefits or a letter from the employer. B. Check the appropriate boxes if your parent/parents have benefited from any of these programs. If none apply, check “None of the above.” Note that the names of the programs may differ from state to state but the names listed here are most commonly used. Note. This question is part of a series of “smart questions,” meaning this may appear differently depending on the user. A. Depending on which form they used to file their tax return, here is where they can find where these figures are located within the form: IRS Form 1040: Subtract line 46 from line 56 and enter the total; IRS Form 1040A: Subtract line 36 from line 28 and enter the total; IRS Form 1040EZ: Use Line 10. B. 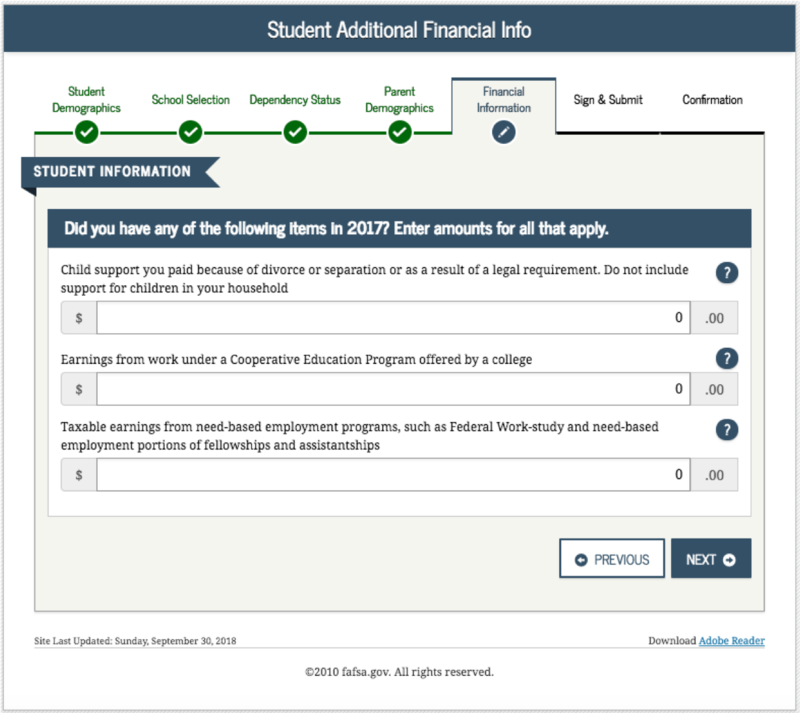 In order to fill out this section, students will need to refer to their parent or parent’s tax form(s) and look to add information from the following spaces for each return: IRS Form 1040: Use Line 6d; IRS Form 1040A: Use Line 6d; IRS Form 1040EZ: If they didn't check either box on line 5, enter 1 if they are single or 2 if they are married. To learn more about this question, click here. A. Include the current total of your cash-in-hand, and totals of your checking and savings accounts. B. Include the net worth of your investments, including real estate, but do NOT include the house that your parents reside. C. Include the total value of your parents’ total investments. To do this, you will add the current value of all investments, subtracting any debts currently owed on them. Note. This is a smart question and the response to your tax return type may generate additional questions and comments. A. You will need to answer this question based on whether or not you (the student) did, have not yet, or will not file a tax return. You should answer this question based on your current tax filing status for the previous year. B. Select what your tax filing status is according to your 2017 tax return. C. You will select “Yes” if it is determined that you could have filed a Puerto Rican or foreign tax return for 2016. You will select "No" if you didn't. 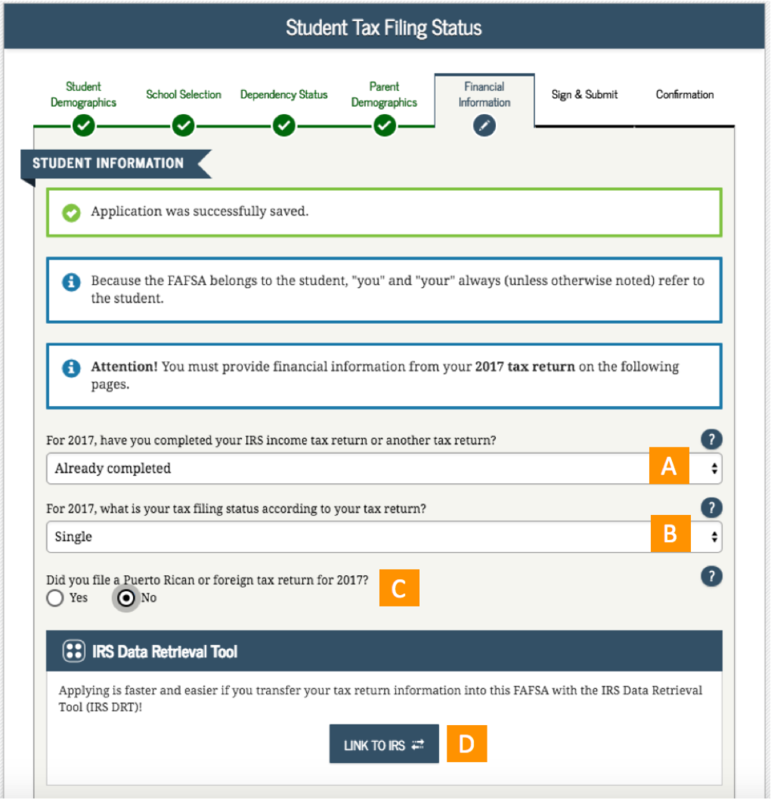 D. By using the IRS Data Retrieval Tool, students who are eligible can automatically transfer their tax information into the FAFSA. This will prevent errors and help avoid any processing delays. Answer the questions whether or not a tax return was filed. This information may be on the W-2 forms or on the tax return selected in question 33: IRS Form 1040—lines 7 + 12 + 18 + Box 14 (Code A) of IRS Schedule K-1 (Form 1065); 1040A—line 7; or 1040EZ—line 1. If any individual earning item is negative, do not include that item in your calculation. 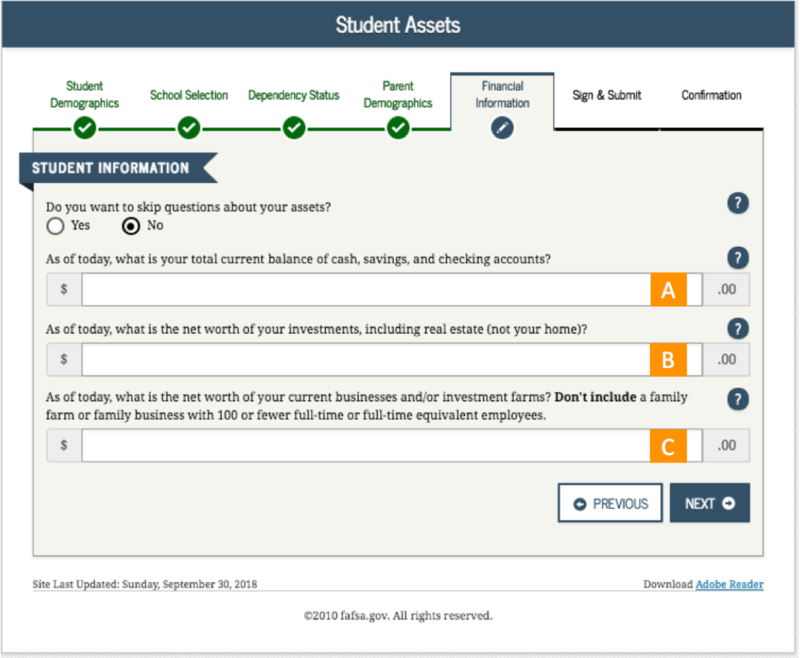 If a student receives income from any of these categories, they must check each applicable box. 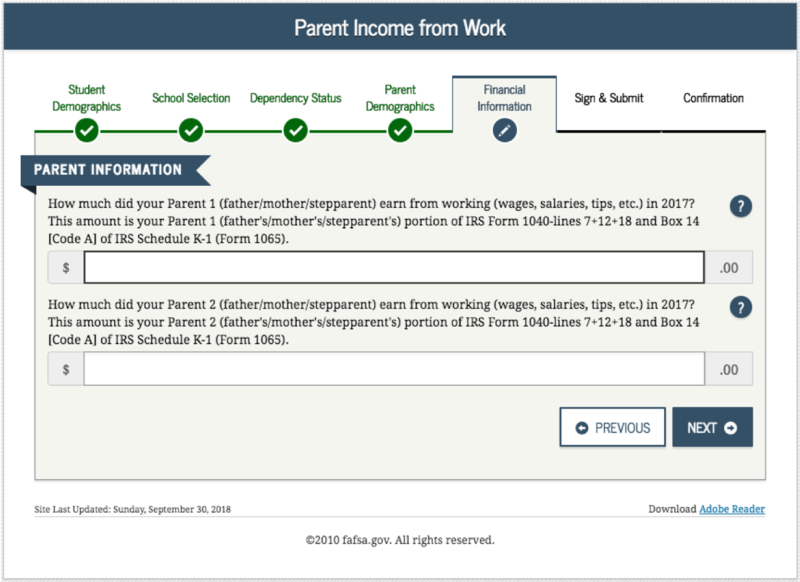 If students are married and have a spouse, they should also report their spouse’s information (such as taxable earnings from need-based employment programs and combat pay) along with their own. 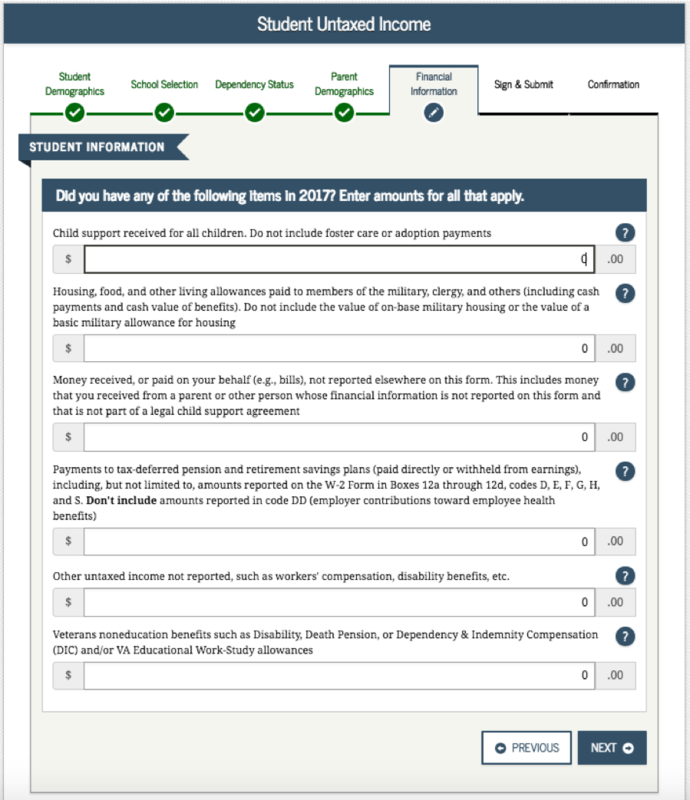 If a student had income in any of the following categories during the past year, they must fill out the appropriate boxes that apply to them. 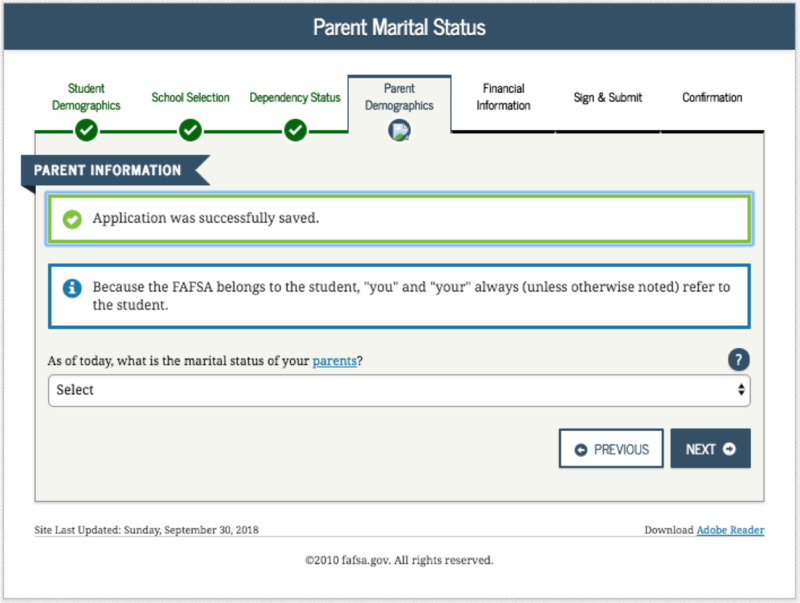 In all of the above scenarios, if students are married and have a spouse, they should also report their spouse’s information on the FAFSA alongside their own. Note.This is a smart question and may look different for users based on inputs. 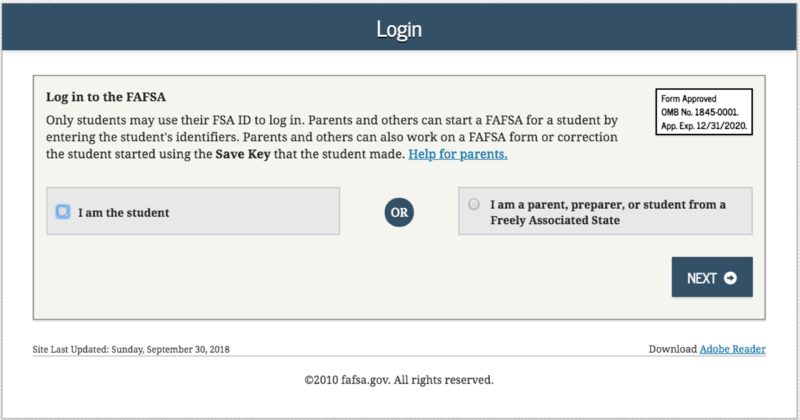 Note: You have not yet completed the FAFSA if you are on this page. Select "Agree" if you agree with the terms. 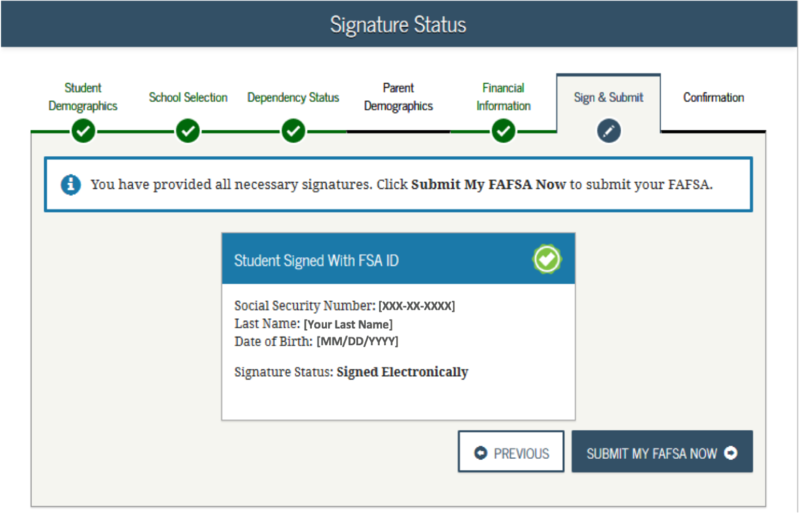 Electronically sign the FAFSA here. 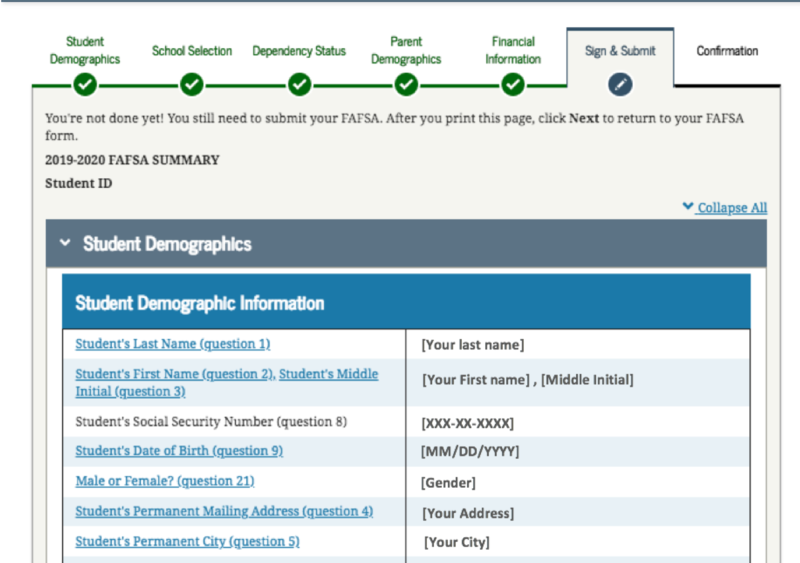 Once you have reached this page, you may click “Submit my FAFSA Now” to submit. Congratulations! 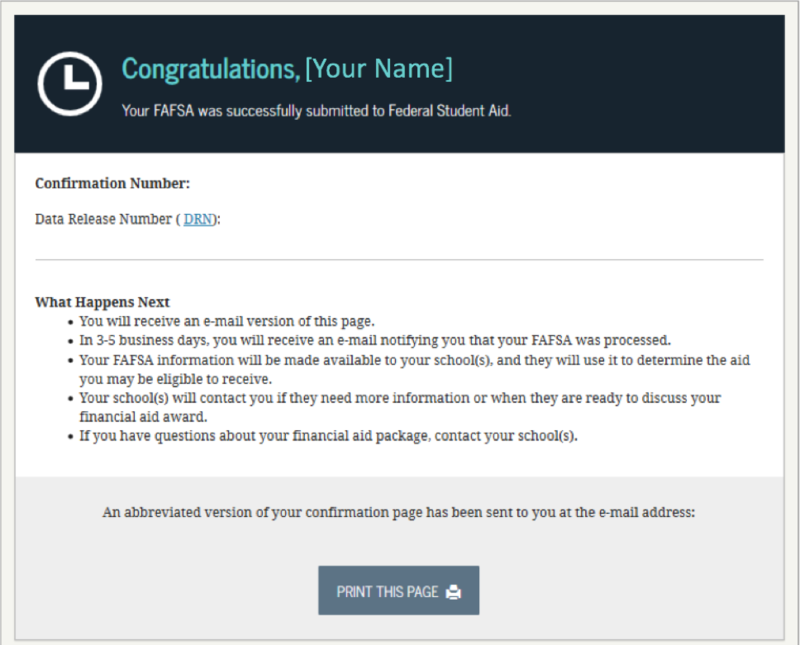 Your FAFSA has been officially submitted. Once you submit your FAFSA, plan ahead by applying to scholarships that fit your qualifications. To find the perfect fit, use our free college scholarship guides to sort through scholarships based on your eligibility, award amount and if you qualify for need-based aid.